The controversy over Sinclair Broadcast Group's media-bashing promos has quieted down. But the headache isn't going away. Inside some of Sinclair's local TV stations, there have been small acts of rebellion — anchors who refused to read last month's promos, reporters who have spoken out against the company's mandates. There's also resentment toward Sinclair management. Those feelings are not universally held, however. Staffers are divided over the significance of Sinclair's corporate interference: Some are so disturbed by it that they want to quit, while others are more tolerant. Some are relieved that the company's conservative tilt has been highlighted by the national news media while others believe the issue has been overblown. But whether they agreed with the promo campaign, or were aghast by it, all of the sources interviewed by CNNMoney in the past week agreed that company morale is low. One longtime staffer even used the word "despair." CNNMoney spoke with 13 current and two former staffers from a cross-section of Sinclair-owned TV stations, plus sources inside management, most of whom insisted on anonymity. "This is so much bigger than us," one local anchor remarked. "I don't want people to lose faith in journalists." That's ultimately what this controversy is about — the credibility of local journalists and the stations where they work. Anchors and reporters are concerned that their credibility has been dented by Sinclair's "journalistic responsibility campaign." Deadspin compiled the promos in a video that went viral. It showed dozens of local Sinclair anchors reading the same script. Deadspin compiled the promos in a video that went viral a week and a half ago. 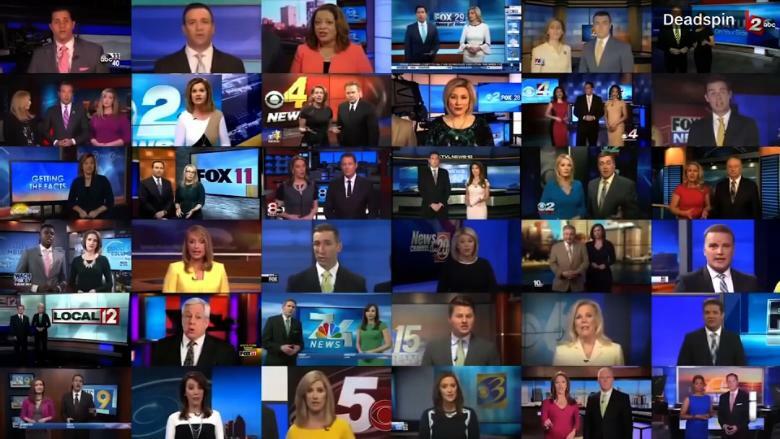 It showed dozens of local Sinclair anchors reading the same script decrying "fake" and "biased" reporting — echoing President Donald Trump's anti-media messaging. Multiple anchors had previously alerted CNNMoney to the promo requirements because they felt it was inappropriate. But the video mash-up made it "real" and rattled the company's newsrooms from coast to coast. Now there are dismayed and disappointed Sinclair journalists from coast to coast. Even some employees who didn't originally object to the language are now embarrassed by the fallout. Several staffers predicted a talent drain in the months and years to come, subject to the onerous contracts that many anchors and reporters work under. But Sinclair management continues to defend the initiative. "We find it extremely ironic that the entire basis for our promos was to point out how false narratives can spread on social media, which is precisely what happened here," a Sinclair spokesman told CNNMoney. When asked if the company regrets the mandated media-bashing initiative, the spokesman said, "We disagree with the framing of the spots as being anti-media. They are decidedly pro-fact-based reporting. If you are asking if we regret promoting fact-based reporting, the answer is of course no." Some current and former staffers aren't buying that rationale — especially because Sinclair requires stations to run pro-Trump commentaries and other political programming. Adam Bagni, a former anchor at Sinclair's Providence station WJAR, wrote in an op-ed that the company "is attempting to use its local stations" to "advance its own political agenda." Jonathan Beaton, a former reporter at Sinclair's West Palm Beach station WPEC, said on CNN's "Reliable Sources" that the company's bias is "insidious" because it is delivered through trusted local journalists. He left Sinclair in 2015 and now runs a P.R. firm. His account of corporate interference mirrors what other staffers have said. "Must run" stories with a conservative bent have been a part of Sinclair's operation for years — which is why some of the sources interviewed for this story were bemused by all the sudden attention. But at the same time, there's a sense among some longtime staffers that the corporate dictates are becoming more oppressive. The promo was the last straw for one Nebraska producer, Justin Simmons, who resigned last month as a result. When the Deadspin video came out, a handful of anchors who had to read the promos tried to distance themselves from it via social media. Delaine Mathieu at WOAI in San Antonio said on Facebook that "I voiced my concerns about it — but I'm a mere flea on an old dog." Like other staffers, she emphasized that she's in the news business to report on her local community. To be sure, Sinclair produces a huge amount of local news, both on TV and on the web, that is untouched by management. There's a fear in local newsrooms that this distinction is being lost. Lauren Lapka, an anchor at KVAL in Eugene, Oregon, who refused to participate in the promo campaign, alluded to the controversy by posting a journalism code of ethics on Facebook. "I always strive to follow" this, she wrote. Many anchors at Sinclair-owned stations are subject to contractual language that includes penalties for leaving the company. Beaton is suing the company for that reason. Bagni's op-ed argued for state laws "barring non-compete clauses for broadcast journalists." 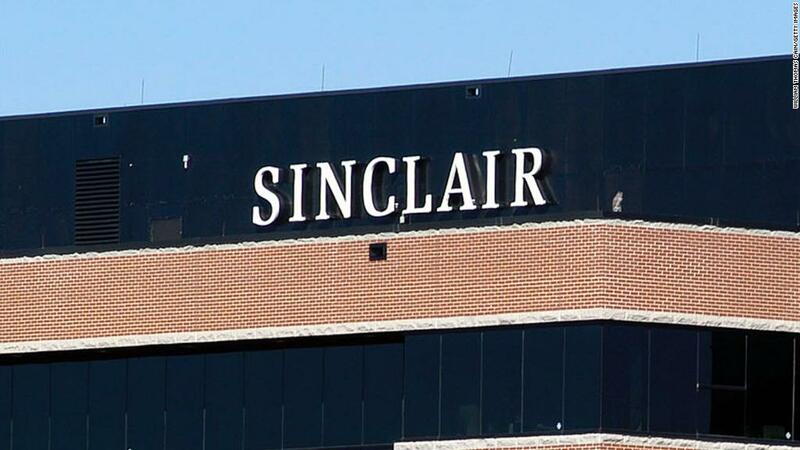 Thinking about leaving Sinclair is also complicated by the fact that the company is big and trying to get bigger — it is awaiting government approval for its acquisition of Tribune Media. More consolidation means fewer potential employers. A Sinclair executive asserted to TVNewsCheck over the weekend that the promo controversy was whipped up, in part, by opponents to the deal. Numerous staffers feel that management's responses to criticism have been tone-deaf at best. Most notably, the company rescinded a planned $25,000 donation to the National Press Photographers Association after the group criticized the promo campaign. Sinclair's flagship station, WBFF in Baltimore, has a loud and proud history with the group. Hallways at WBFF are adorned with its plaques and certificates. "People are taking it personally," a WBFF staffer said of the backtracking. Staffers at KOMO in Seattle and other Sinclair stations chipped in donations to the group — a gesture of goodwill to partly make up for the lost $25,000. The NPPA has received $11,000 in recent days, both from staffers and outsiders. What do employees want? "No more must-runs"
In interviews, several Sinclair-owned anchors and reporters pointed out that there's been no significant ad boycott directed at the stations. That's partly because a boycott effort in dozens of local markets is much harder to pull off than an effort against a specific show on cable news. The impact of the controversy are harder to measure — because it's about credibility and connection with the viewing audience. "If I could say anything to the owners of Sinclair, I would say, give back content control to the newsrooms. No more 'must runs,'" said one of the journalists who originally raised a red flag about the promos. "No more forcing us to read statements of any kind. No more making us fear for our jobs if we speak out and question authority," the journalist added. Questioning authority, after all, is part of the job.